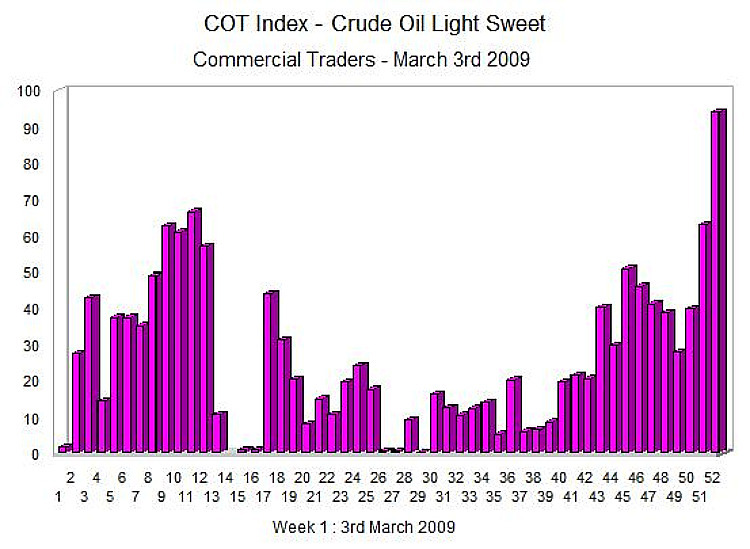 The COT index is still extremely volatile with peaks one week and troughs the next, and with no real direction or indication of a price trend, which in many ways reflects the market at present, with prices consolidating in a relatively narrow trading range in the daily oil price between $35 and $50 per barrel. As you can see from the chart, this week has registered a very low figure approaching zero, and for this to be meaningful we will need to see this confirmed in the index next week, and if so, then this could suggest we are about to see a rise in oil prices in the next few weeks. Clearly we cannot rely on one weeks data to base our trading decisions, but it is an interesting signal for the next period, particularly if the figure from next weeks report is at the same low level. This would suggest that the commercial contract holders have stopped selling futures, in the expectation that higher prices will follow shortly, so we may be seeing a floor to the current oil price decline from last year. The latest oil prices are now available on the daily oil price live chart, along with an economic calendar, and live news feed.